A strong Hibs Development Squad team lost 3-2 to their Celtic counterparts last night at Ainslie Park. Celtic’s Calvin Miller and Jordan Sinclair for Hibs both scored excellent goals, but it was Joseph Thomson’s finish that gave the Glaswegians the half-time lead. Farid El Alagui levelled from the spot for Hibs, before Callum McGregor won the game for Celtic soon after. Hibs star Sam Stanton fired wide within a 60 seconds, but the first shot on target heralded a goal, and it was Miller’s fine effort from 20 yards out that dipped over Tomas Cerny and into the bottom corner in the 18th minute. Cerny is just back playing after suffering a bout of mumps following Sam Stanton’s case earlier in the season. Hibs responded well, El Alagui had a shot saved, before Sinclair found the bottom corner with a superb volley from Stanton’s corner with 25 minutes gone. Thomson put the Hibs defence under pressure, and he got his reward in the 33rd minute as Darnell Fisher’s cross was turned home by the forward to make it 2-1. Five minutes after the break, it was 2-2. 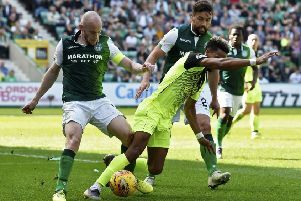 Hibs striker Martin Boyle was fouled by Leonardo Fasan and El Alagui levelled from the spot. The joy of being back in the game was short lived, however, as, in the 52nd minute, Cerny was deemed to have handled a back-pass and from the indirect free-kick Callum McGregor found the net to make it 3-2. The game remained an open affair with both sides spreading the play about well with some good passing play, but Hibs had the two best chances following McGregor’s goal with Jordon Forster and Boyle both coming close to a leveller. Boyle fired over the cross bar in the 89th minute and he also had a good shot blocked just minutes earlier. The defeat was the second in two games for Hibs in the Development League following Friday’s 2-1 loss to St Johnstone. Hibernian Development Squad starting line-up: Cerny, Dunsmore, Crane, Forster, McGregor, Scott, Sinclair (Duthie, 64), Hendry, El Alagui, Boyle, Stanton. Unused substitutes: Perntreou, Stirling, Watson.